In the past, our comics used fictional “SUPERHEROES”. 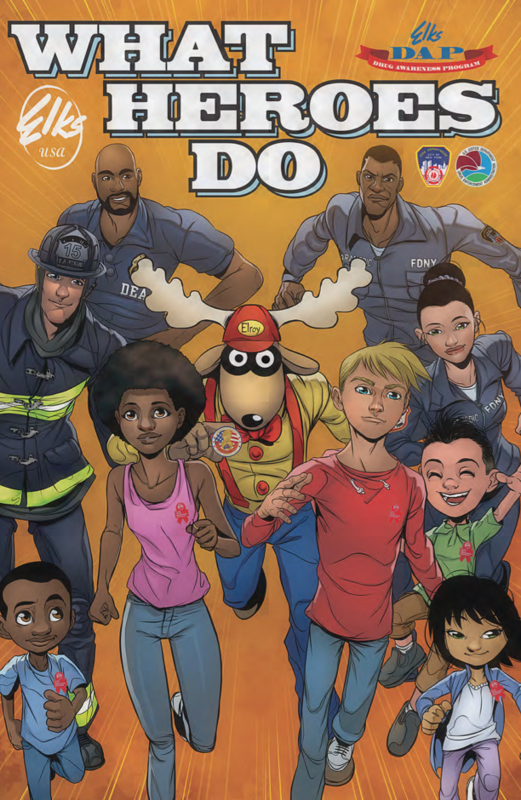 “What Heroes Do” features actual everyday heroes and kids who become special heroes because of the decisions they make every day to stay drug free and always be the best they possibly can be. While reading this comic, you will learn of kids your age who are put in a situation in which they have to use skills they learned from their parents and at school and then work together to save the life of their friend. The Elks are totally committed to giving you factual information about the use of illegal drugs and the abuse of legalized drugs. We have developed many educational and fun tools that will teach you how to be a good friend and a good citizen. We want you to realize that there are many ways to be a hero, and you do not have to wait until you’re an adult to be one. You can be a special hero right now by doing what you know is right and having the courage to say NO to the things you know to be wrong.